You are looking at a 100 foot EarthStraw hand well pump kit. The 100 ft. hand pump system is complete including a 2 foot filler hose, however you will need to choose the mounting options for your well. For temporary rapid-deployment installations in any "open-well" choose the EarthStraw Casing Clamp (SKU: ESCC-001). For permanent installations there are many simple mounting options in the EarthStraw Accessories Section. These are also reviewed in the EarthStraw Instructional Video below. The EarthStraw hand well pump kit is easily the world’s simplest and most versatile hand well pump system. It was invented, engineered and is manufactured in the USA and is designed for rapid deployment. This 100 ft. hand pump system may be installed temporarily or permanently…may be stored indefinitely…fits into almost any well without affecting the existing electrical equipment…and the list goes on! The EarthStraw hand well pump kit is extremely durable, lightweight and portable. As a point of reference, the 150 foot system weighs about 25 lbs. (dry) so that it may easily be carried to the well and installed in minutes…all by one person. If you need to relocate, only a few minutes are needed to uninstall, drain and re-coil this 100 ft. hand pump system for storage or transport. The shipping and storage carton measures 36” x 36” and will fit into even the most compact car. The EarthStraw "Code Red" 100 ft. hand pump system is only 7/8" in diameter, and is flexible, allowing it to snake through small access points, and around obstacles in the well. It will lift water up to 150 feet vertically, so as long as the foot-valve can reach the static water level in any well, EarthStraw can provide for your water needs. The system may be ordered in hand well pump kits (50 feet, 100 feet, 150 feet, etc.) or in custom lengths up to 170 feet long. The ideal system length is "actual well depth minus 10 feet". This locates the foot-valve 10 feet above the bottom of the well to keep the system from pumping bottom-silt. The further your foot-valve is submerged below the water line, the more available water "reservoir" you will have. Also, deeper water is typically more filtered and will likely be cleaner and less susceptible to surface contaminants. If you choose to leave it in your well, the pump handle is removable to discourage tampering. We also have black or camouflaged cover bonnets available to make your hand well pump kit discreet. Every home would be safer with an EarthStraw well pump system. It can produce as much water per minute as the average household faucet, and can be easily pumped by a child. One system can supply the water needs for several families. If you are ordering 10 systems or more, call toll-free, 855-435-6525 for discount information. My situation was a 280 foot deep well with a static level of 70 feet, delivering 4.5 bpm, in granite. Installed 100 foot code red earth straw which first time installation took 1.5 hours from removing and then assembling unit on the tailgate of my truck, and then installing and pumping water. Works well. Covered well and pump assembly with an empty 55 gal drum. Now I have water. We ordered most all options with the Earth Straw for better portability. Our well diameter is a 5”, using a 4-bolt “sandwich” for the cap, and includes wiring to a submerged electrical pump at the bottom. The cap was redesigned to work with a Gripper Nut (drilling a couple of holes). Now we have Gripper Nut included in the cap of our well … ready for the Earth Straw stored in the shed. Good Stuff. I have wanted a well pump system for a couple of years and never saw one like the EarthStraw with flexible hose. I purchased the 100 ft. system which put me at the perfect depth in my well. I was extremely impressed with the fact that the system was so easy to assemble, just as the video shows. I made one small mistake because I did not READ the instructions closely enough. When I called the company for help they were very patient and helpful. In a very short time we had the problem fixed. This system was very easy to install and very easy to slide into the well. I stretched the hose out across my yard. Slid the end thru the well cap and it went down easily. Its flexibility lets you work it around anything going down the well. This system is exactly what they say it is and they are a great company to deal with. I needed some guidance from Corky Baker, but seems to work fine now. 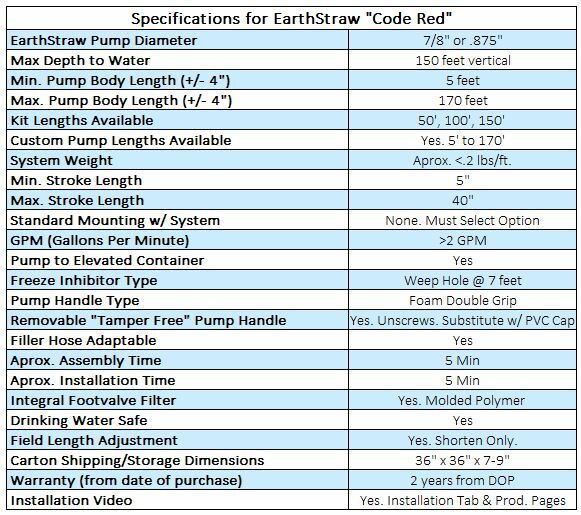 Click the button below to add the EarthStraw "Code Red" 100 Foot Pump System to your wish list.